Google Earth App for iPad is a cool little app that lets you travel the globe while staying in one place, and even lets you see the top of your house. 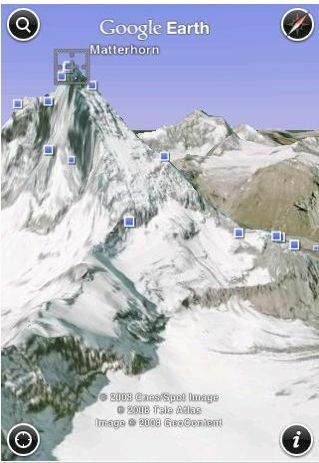 If it’s on this Earth and you want to see it, Google Earth iPad App will let you do just that. Open Google Earth and you’ll see a globe circling around in space. When it comes to a stop, simply tap on the location that you want to visit. Using the app this way is great if you want to see something large, such as a mountain range, but not so great if you want to see something relatively small, such as a hockey arena or your house. For these smaller-scaled images, you’ll want to use the Search button. The Search button will let you type in a building, an address, or a road and it will take you there in about one second. Zoom in by tapping the screen, or by simply “reverse pinching” with your thumb and forefinger close together, and then moving them outwards. You can also tap the screen twice and the image will zoom out for you. The graphics of this ipad app are really cool, with effects that make it look as though you’re actually flying over the Earth as you go from place to place. What it is lacking is sound. Some sort of background noise would be good, because you’re going to be spending some time in this google earth app for ipod touch or ipad. And because Google Earth works over the Internet, you are going to need to make sure that you’re in a WiFi zone before you start traveling the globe. The Google Earth ipad app is compatible with the iPod Touch as well as the iPhone and is absolutely free. You can download it here.